The pool table is in excellent shape. Coin operation system is functional. Local pick up. no shipping. 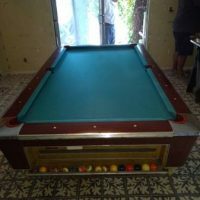 Connelly Pool Table and accessory rack that is in excellant condition. Buyer must pick up, no delivery. Brand New Presidential Billiards 7' Pool Table Made Of African Teak Wood With A 3 Piece Slate.